Hobie Forums • View topic - 6-8-06 Crew in brig; 6-9-06 Captain kayaking in Newport. 6-8-06 Crew in brig; 6-9-06 Captain kayaking in Newport. Post subject: 6-8-06 Crew in brig; 6-9-06 Captain kayaking in Newport. It was the night before a kayak training mission in Newport Harbor: Captain was just settling into the midnight watch when all heck broke loose. The yowling, growling, and screaming was enough to wake the dead! Rushing to the rear entrance to the base, Captain found Crew (aka darn cat) locked in combat with a much bigger opponent. Crew had discovered unauthorized personnel at the very walls of the base and had acted to defend against the white, long-haired trespasser! Crew had the infiltrator by the throat, Crewâ€™s forelegs were braced straight and tight against the interloperâ€™s chest, and Crewâ€™s hind legs were a blur - harvesting bales of white cat cotton from the much larger invaderâ€™s chest and belly. The apparent terrorist was experiencing Crewâ€™s mastery of cat-fu, didnâ€™t like it one bit, and was yowling and screaming loud enough to register on the Richter scale. Crew kept the prisoner occupied while Captain moved in to assist in the arrest, being careful to stay where Crew could watch the approach. White hair also saw Captain approaching and re-doubled the vocal complaints that were splitting the night. Fangs bared in screaming defiance and eyes wide with angry disbelief, the white interloper was â€“ the neighborâ€™s prize show cat! Captain knew he and Crew were in trouble and would hear from the Admiralty. While avoiding getting between their claws and teeth, Captain did what he had to do to separate the combatants. Miss stupid-name-best-of-breed-let-me-show-you-our-latest-blue-ribbon was a white streak making for the perimeter fence with Crew a dark blur glued to her tail. The two jetted to the top of the six-foot barrier and white-hair leapt off into space, while Crew kept the high ground, locked on point, ears flared proudly erect, back fur bristling tall, and tail whipping in rattlesnake-like defiance to all would-be challengers. As usual Crew remained silent throughout the combat, letting his actions speak volumes. No one said anything about conditions in the brig, apparently assuming Crew would suffer from more than just deprivation of liberty, but Captain knew Crew had been in the right. 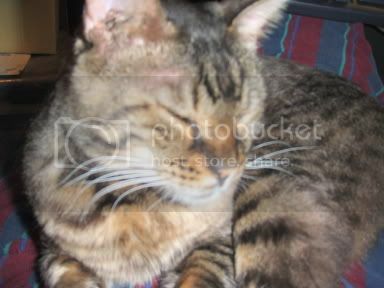 Crew had tuna, gourmet dry food, fresh litter in the privacy-screened box, two full water bowls, and his favorite running fresh water (a drip from the bathtub spigot) for the duration. Captain hated to leave Crew but had a mission: ocean kayak training, including survival fishing, in and just outside of Newport Harbor in southern California. Leaving the Taurus transport vehicle in section 43D of the economy lot at Sacramento International Airport, Captain endured a mechanical delay and a bumpy flight to Ontario Airport. Rendezvous with an old friend (who would also participate in the training), and scheduled contact with instructor Den Farrier of Central Coast Kayaking and the Hobie Pro Staff went smoothly. 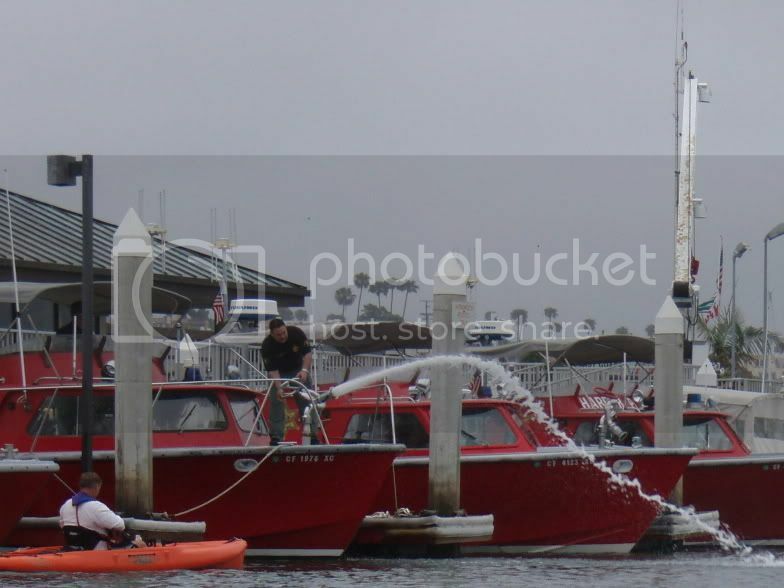 The next morning Captain and his old friend Steve drove to meet with Farrier â€“ and his buddies Steve and Bob - at a strip beach access to Newport Harbor located at Balboa Avenue and K Street. Shortly after 0730 all five were on the water in Hobie kayaks: Outbacks for both Steves and Farrier, Adventures for Captain and Bob. Captain quickly caught two sand bass on small plastic swim baits threaded on small leadhead jigs. Other also caught small fish. The group tried in front of the Coast Guard station with nothing to show for several hits for each of them. Farrier directed the group toward the bait receiver area close to the harbor mouth. 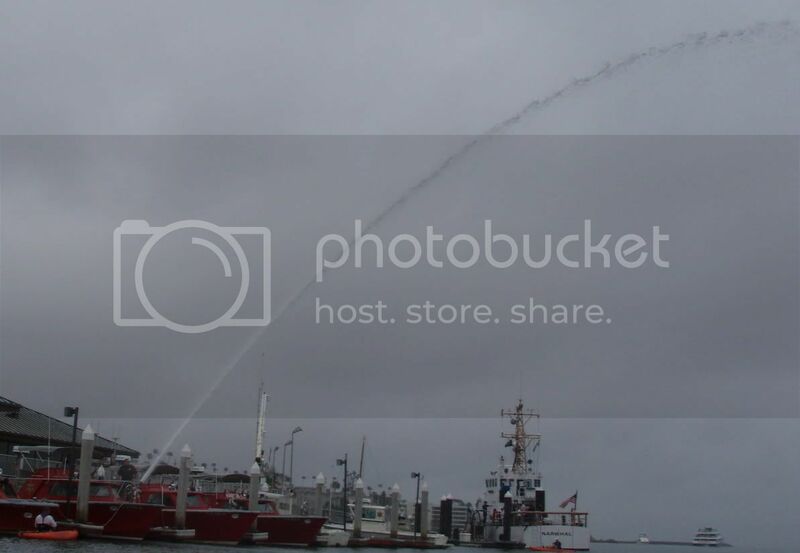 Along the way we observed a fire boat testing a water cannon. Captain continued to get hits but no hookups. As they neared the bait receiver Captain was brought to a heightened state of situational awareness by seeing a large dark dorsal fin, back, and tail fin roll just behind the receiver barge. As Captain later learned, friend Steve found the ocean swells a little less than pleasant and did not go to or beyond the harbor mouth. Captain however was enjoying everything about the Hobie Adventure in the saltwater and happily went with the other Steve out to join Bob almost to the Newport Buoy to fish and experience the ocean swells (and occasional boat wakes). Captain continued to get occasional hits and watched the other Steve bring a small mackerel to the boat. Farrier joined Captain while the other Steve pedaled off to join Captainâ€™s friend Steve. Farrier and Captain stayed out near the buoy and fished with no success while trading some personal history and talk about kayak fishing. 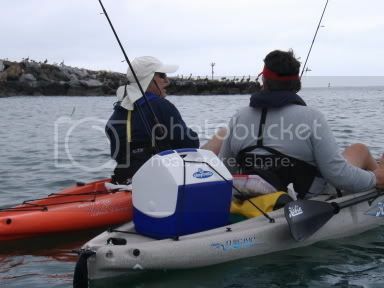 Captainâ€™s thoughts were all about customizing the Adventure for more effective fishing and about the amazingly intimate experience of the ocean from a kayak. After what seemed too short a time to Captain, he and Farrier pedaled to find Bob, and Captain experienced how hard it is to see even brightly colored kayaks a few hundred yards away on the ocean. Farrier decided to visit with Bob a little and sent Captain to slowly make his way back to the harbor mouth. Farrier and Bob came along a while later and the three headed into the harbor. Great report Don, and in my old stomping grounds where I grew up no less--Newport/Balboa. And give my congrats to Crew for repelling boarders in fine fashion! How did you manage to get assigned to the training mission? Post subject: Captain rejects Crewâ€™s psycho-babble. How did Captain get assigned to the Newport training mission? Captain believes the ways of the Admiralty are mysterious beyond understanding. Post subject: Crew (aka darn cat) meditating. Post subject: Steve and Den just AFTER halibut release. Steve and Den just AFTER halibut release. Post subject: See post not too related to kayaking. If interested, see Captain and Crew post not too related to kayaking.